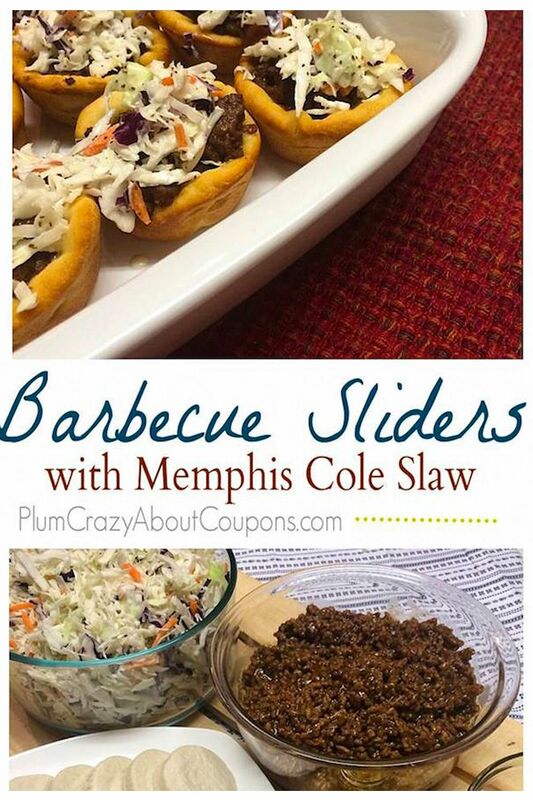 BBQ Sliders with Memphis Slaw Recipe | Be Plum Crazy! 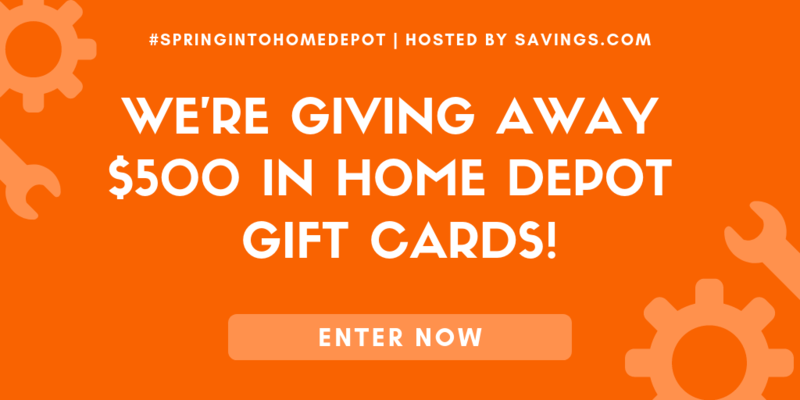 With BBQ season in full swing, now is the time to start thinking about all those amazing summer events you will be attending. Of course every event you go to you should bring something and these BBQ Sliders with Memphis Slaw will be a sure hit with party goers. 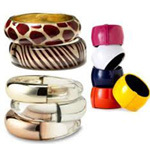 If you have friends on the Weight Watcher’s plan we have added those details in as well so they can stick to their meal plans. These make an amazing light summer dinner for the family as well! Although they are amazingly good and full of flavor, they are also quite messy so getting bibs for the adults may be something those that will be enjoying these would appreciate. Brown ground beef and drain excess oil. Place beef in mixing bowl and add barbecue sauce stirring to combine. 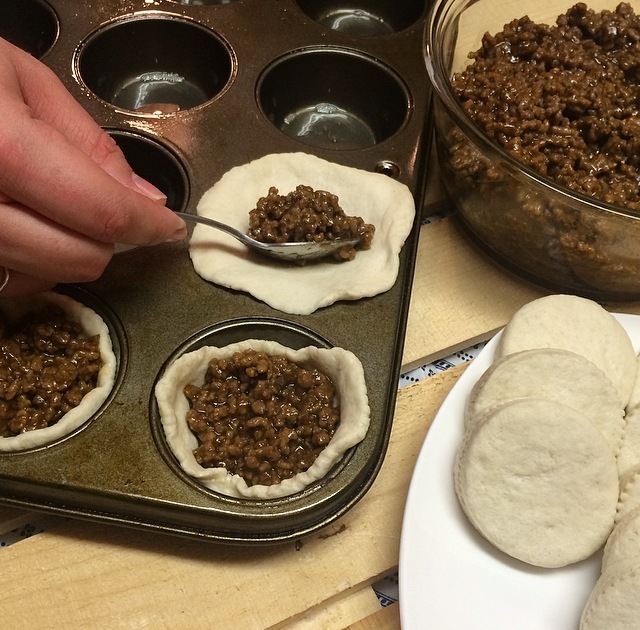 Press biscuit dough into bottom of muffin tin and fill with approximately 2 tablespoons of barbecue meat mixture. Place in preheated oven and bake for 7-10 minutes or until biscuits are browned. Meanwhile, combine all slaw sauce ingredients in a large mixing bowl and stir to combine. Add bag of slaw mix and toss to evenly coat with sauce. Once barbecue biscuits have finished baking, let cool for 5-10 minutes. 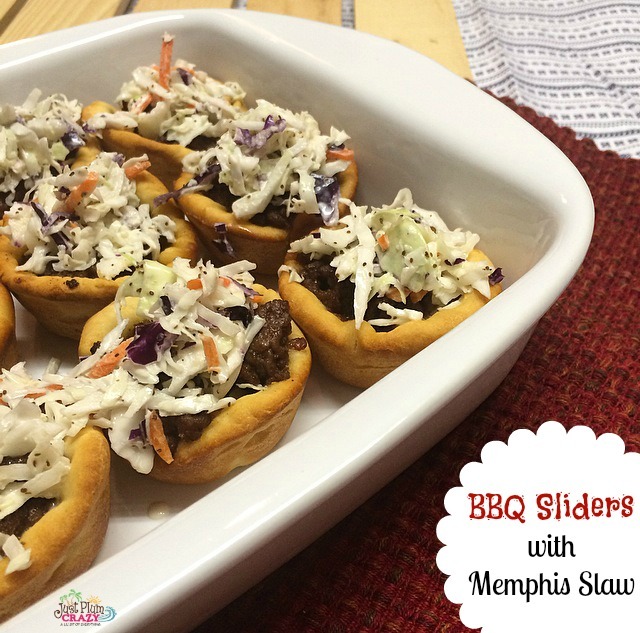 Crunchy slaw goodness atop delicious barbecue beef make these sliders a perfect BBQ dish or light summer dinner. 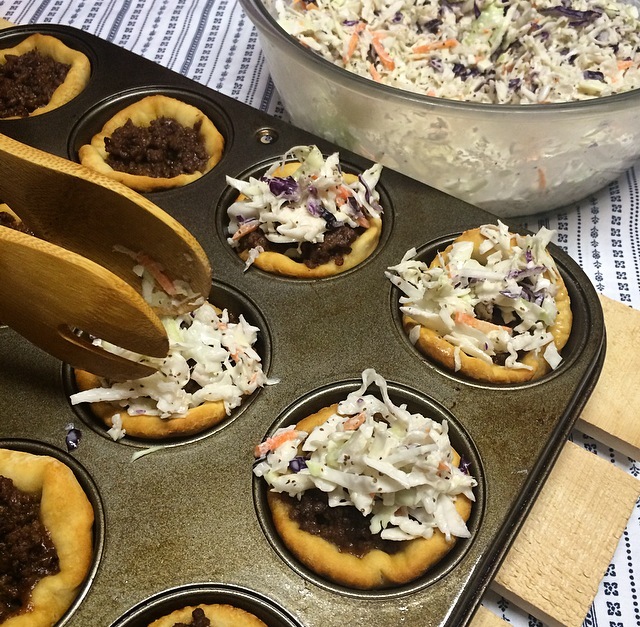 Top with slaw or serve slaw on the side. 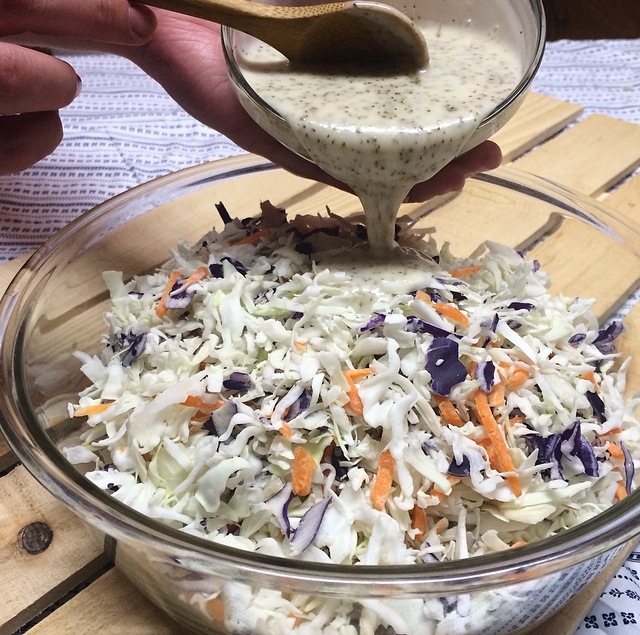 If topping with slaw, you will only use about 1/2 of the slaw, so you may want to half the recipe. 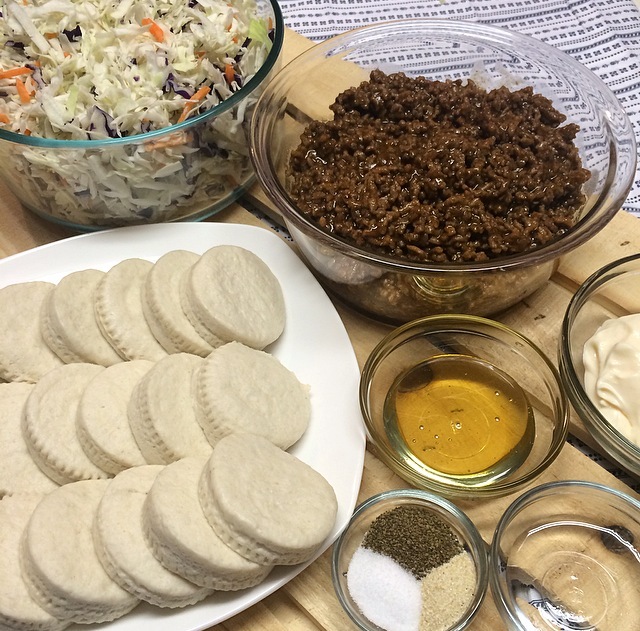 If serving slaw on the side, it makes enough servings to be used as a side dish. I love the combination of coleslaw with BBQ ! Great recipe for the summer.